Its flexibility and close grain make it suitable for a number of applications, similar to those for willow. The Greeks and Etruscans made shields of poplar, and Pliny also recommended poplar for this purpose. Poplar continued to be used for shield construction through the Middle Ages and was renowned for a durability similar to that of oak, but at a substantial reduction in weight. Some stringed instruments are made with one-piece poplar backs; violas made in this fashion are said[ citation needed] to have a particularly resonant tone. Similarly, though typically it is considered to have a less attractive grain than the traditional sitka spruce, poplar is beginning to be targeted by some harp luthiers as a sustainable and even superior alternative for their sound boards:  in these cases another hardwood veneer is sometimes applied to the resonant poplar base both for cosmetic reasons, and supposedly to fine-tune the acoustic properties. 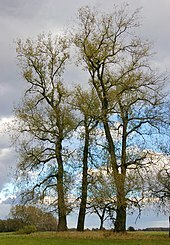 Two notable poems in English lament the cutting down of poplars, William Cowper's "The Poplar Field" and Gerard Manley Hopkins' " Binsey Poplars felled 1879". ^ Yadav, Rakesh (2009). 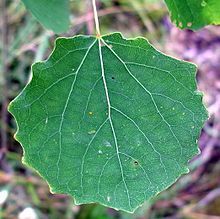 "High frequency direct plant regeneration from leaf, internode, and root segments of Eastern Cottonwood (Populus deltoides)". Plant Biotechnology Reports. 3 (3): 175–182. doi: 10.1007/s11816-009-0088-5. ^ Nassi; Di Nasso, N.; Guidi, W.; Ragaglini, G.; Tozzini, C.; Bonari, E. (2010). "Biomass production and energy balance of a twelve-year-old short-rotation coppice poplar stand under different cutting cycles". Global Change Biology Bioenergy. 2 (2): 89–97. doi: 10.1111/j.1757-1707.2010.01043.x. ^ Dou, C; Marcondes, W.; Djaja, J.; Renata, R.; Gustafson, R. (2017). 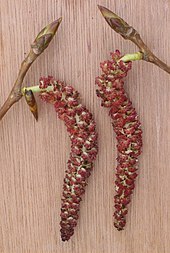 "Can we use short rotation coppice poplar for sugar based biorefinery feedstock? 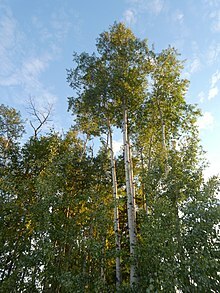 Bioconversion of 2-year-old poplar grown as short rotation coppice". Biotechnology for Biofuels. 10 (1): 144. doi: 10.1186/s13068-017-0829-6. PMC 5460468. PMID 28592993. ^ Dou, C; Chandler, D.; Resende, F.; Renata, R. (2017). "Fast pyrolysis of short rotation coppice poplar: an investigation in thermochemical conversion of a realistic feedstock for the biorefinery". Biotechnology for Biofuels. 10 (1): 144. doi: 10.1021/acssuschemeng.7b01000. ^ "Archived copy". Archived from the original on 26 March 2012. Retrieved 1 July 2011. CS1 maint: Archived copy as title ( link) Rees Harps Website, "Harp Myth #8". ^ Guidi Nissim, W.; Palm, E.; Mancuso, S.; Azzarello, E. (2018). "Trace element phytoextraction from contaminated soil: a case study under Mediterranean climate". Environmental Science and Pollution Research. 25 (9): 9114–9131. doi: 10.1007/s11356-018-1197-x. PMID 29340860. ^ Justin, MZ; Pajk, N; Zupanc, V; Zupanƒçiƒç, M (2010). "Phytoremediation of landfill leachate and compost wastewater by irrigation of Populus and Salix: Biomass and growth response". Waste Management. 30 (6): 1032–42. doi: 10.1016/j.wasman.2010.02.013. PMID 20211551. ^ Gordon, M; Choe, N; Duffy, J; et al. (1998). "Phytoremediation of trichloroethylene with hybrid poplars". Environmental Health Perspectives. 106 (Suppl 4): 1001–1004. doi: 10.2307/3434144. JSTOR 3434144. PMC 1533336. ^ Spriggs, T.; Banks, M. K.; Schwab, P. (2005). "Phytoremediation of Polycyclic Aromatic Hydrocarbons in Manufactured Gas Plant–Impacted Soil". J. Environ. Qual. 34 (5): 1755–1762. doi: 10.2134/jeq2004.0399.